Welcome home, Children of the Fence. After our long journey, we’ve arrived here, at the burning of Star IV. The rebellion reignited by Jesse, the Keywork hanging perilously in the aftermath of Coheed and Cambria’s deaths, and Claudio resolute in his revenge as he looks to become The Crowing. We finally delve into both volume 1 and 2 of Good Apollo I’m Burning Star IV, From Fear Through the Eyes of Madness and No World For Tomorrow. This is the beginning of the end, our final foray until Vaxis – Act I ushers in a new suite in The Amory Wars universe. To finish this I’ve enlisted the aid of fellow editor David to dig into the remainder. Let’s do this! The first part of Good Apollo marks the biggest departure from the story yet, as the in-story fourth wall is smashed to pieces with the introduction of The Writing Writer who is actually writing The Amory Wars story. It’s a subplot unto itself and has great implications for the finale of the sci-fi epic. 2017 marked the release of another 12 issues chronicling the delve into meta that is I’m Burning Star IV. Hope you’re ready for the most messed up part of the story! We’ll try to be as clear as possible with our explanations, but it’s going to understandably get a little wild with two protagonists in two story arcs that intersect often here. The story opens with with Claudio Kilgannon dreaming, wearing the cloth of a priest, situated in the study of The Writer. Skeletal figures come to Kilgannon beckoning to be saved, the words ‘God Only Knows’ painted in blood before him. The figures overwhelm Kilgannon, who then stabs himself in the hand with a screwdriver in order to jolt awake, escaping the nightmare. power to accomplish such a monumental feat? The Crowing, Kilgannon himself. The mantle of The Crowing, one steeped in prophecy, is a responsibility that Claudio struggles with intensely. 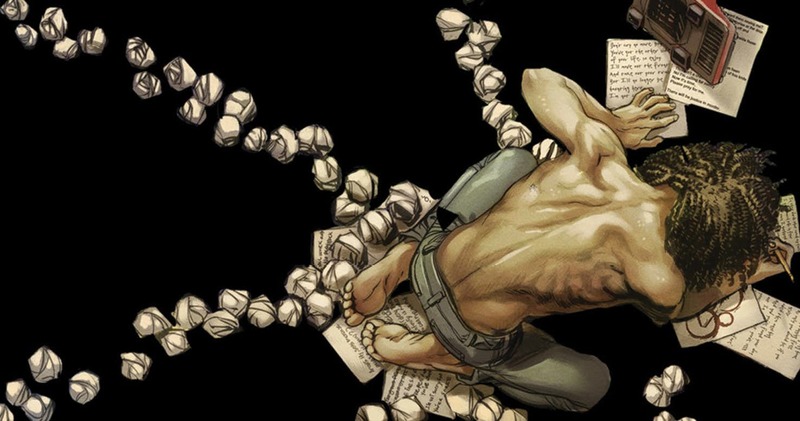 Next, we are properly introduced to the Writer, the literal writer of The Amory Wars story. He is also… very disturbed. He has obsessive, violent thoughts regarding a woman named Erica Court, an ex-girlfriend of the Writer who apparently cheated on him. He has visions of killing her, and it’s here that we see those visions manifest in the events of the song “Welcome Home”. The Writer’s concentration is broken when his home is burgled, a thief making off with his bicycle. What may seem like an inconsequential inconvenience for the character has serious implications for later, but for now, let’s return to The Amory Wars story. Leaving The Writer to deal with his real-life problems, we switch focus to Wilhelm Ryan and Mayo Deftinwolf. The two villains reference The Crowing, and how Kilgannon is destined to be – or, since this is prophecy we’re dealing with, already is – the person of prophecy who will undo their plans. Ryan and Deftinwolf must push back again what has been prophesied by killing Kilgannon and Jesse in order to quell his rebellion against the mages of the universe. We return to the Grail Arbor, where once again Kilgannon rests uneasily. Ambellina pulls him out of another nightmare about his family’s untimely, violent loss. Kilgannon, the Prise, and Jesse meet to plan how to get Kilgannon to ascend to his rightful Crowing status. This involves getting to Apity Prime in the Omega Star system, where Ryan’s veritable fortress, House Atlantic, stands. Jesse divulges that they can land in Kalline, a city close to Ryan, because it appears to lack the heighted defensive presence that other areas of the planet have. Kilgannon argues that this may very well be a trap laid by Ryan and his forces, a point that even the pilot of the Grail Arbor agrees with. Still, they reluctantly push forward with Jesse’s plan and prepare for the siege of Apity Prime and House Atlantic. Returning to the Writer’s perspective, we find that he is having stark hallucinations of being in Newo Ikkin’s house. Remember, Ikkin was a former lover of Kilgannon in The Amory Wars story, so it’s here that we see some parallels between our two Claudios and their exes. The Writer sees Kilgannon speaking to Apollo, Ikkin’s dog. ‘Good Apollo, where shall I begin?’, he asks the pup (this is a reference back to the song “The Ring in Return” off of In Keeping Secrets of Silent Earth: 3). Erica Court, the Writer’s ex-lover, is also there, along with his bicycle who has taken on a new form. Called Ten Speed of God’s Blood and Burial, the bike speaks to the Writer and tells him that he can end the story of The Amory Wars by killing Ambellina which will make Kilgannon recognize that he is The Crowing and end the story by destroying the Keywork. The Writer interprets this as killing Erica because of his own delusions and because Ambellina as a character is representative of the good that was in Erica Court. He had been contemplating an ending for the story for some time now, but even through the hallucinations he questions how a bicycle could even be talking to him, let alone about something so coherent. In his mind, the Writer kills Erica with the same substance that caused Coheed Kilgannon to go on a murderous rampage in Second Stage Turbine Blade. The strike on Apity Prime is underway. A team of rebels sabotage a generator on Kalline which would allow the Grail Arbor to land in the city. Before the ship can do so, though, everything goes wrong. It appears that Claudio and the pilot’s suspicions were correct, with Ryan devouring the rebels with the help of a priest, and Deftinwolf ordering a Jackhammer defense cannon be fired at Grail Arbor. The salvo strikes the ship, which makes its retreat, but not before Kilgannon, Ambellina, Jesse, Chase, and the other IRO-bot kids abandon ship onto Apity Prime’s surface. The Prise and Kilgannon run ahead to fulfill the latter’s destiny of finally becoming The Crowing, while Jesse and the others try to hold off Deftinwolf and his army. Jesse steps to the General personally and is summarily killed, with Deftinwolf pulling Jesse’s heart from his chest. The Prise and Kilgannon arrive at The Willing Well, a mirror that offers a look into the ‘real world’ in which The Writer resides. In it, they can see their creator and Ten Speed arguing about Ambellina’s fate. A priest approaches the two characters in the story and fights them, a tussle that injures Ambellina. All while this is happening, The Writer succumbs to further hallucinations involving the skeletal figures from the earlier dream who drag him to a winged guillotine (the same displayed on the cover of the novel itself) to be executed. The undertaker of sorts is none other than Ms. Court. This particular hallucination is dispelled, and The Writer finds himself back at Newo Ikkin’s house. He now sees that Ten Speed is correct and enters his own story’s world via The Willing Well where he sees Kilgannon has already ascended into The Crowing despite Ambellina still being alive, albeit wounded. The Writer beckons that he must kill Ambellina to bring about the end. As he is effectively a god in the universe he created, The Writer easily accomplishes this. The story closes out with Ambellina dying in Kilgannon’s arms, The Writer walking off with Ten Speed. Among his final words to Kilgannon: ‘You’re burning Star IV… all worlds from here must burn’. The second part of Good Apollo, I’m Burning Star IV is subtitled No World For Tomorrow, and fittingly so as – spoiler – it ends pretty definitively with the destruction of Heaven’s Fence. At least that’s what the lyrics and most popular fan theories, stitched together over the years would have you believe. This is an add album to dissect story-wise as there hasn’t been any extra media written to accompany this album yet! No comic, no novel, nothing. Just a few interviews and a video documentary. This has left us Children of the Fence to fend for ourselves and pick things apart to the best of our ability within the little context we have. It’s commonly believed that a lot of characters and story arcs see an end with No World For Tomorrow. It’s important to note that the ‘Coheed motif’, the melody that is present in almost every Coheed album before this one, doesn’t play at the beginning of this album like it does on the other albums. Since that musical motif denotes a passage of time for the story and its characters, the assumption is that the gap of time between Good Apollo, Vol 1 and Vol 2 is short or nearly nonexistent; it picks up right where the previous album left off. The first couple songs on the album seem to point to a Claudio Kilgannon who has truly accepted his fate and now knows what he must do (“The Reaping”). The title track is a rousing battle anthem if I ever heard one. Since House Atlantic is destroyed later in this album’s story (“The Fall of House Atlantic”), the title track can be viewed as a rallying cry for Jesse’s remaining rebel army and IRO-bots. “The Hound (Of Blood and Rank)” is possibly an interaction between Vielar Crom and Mayo Deftinwolf. Seeing as Deftinwolf has failed Wilhelm Ryan in the past and Crom has replaced him on occasion, there might be some sore spots there with both parties, hence the scolding tone of some of the song’s lyrics. “Feathers” is widely believed to be a final meeting of Kilgannon and Newo Ikkin. This is interpreted as either a possible flashback to times before, or chronologically within the greater story of NWFT, but either way the two meet and get some much needed closure. The chorus of ‘hide your feathers on the back porch’ might be a reference to putting the past behind you and looking forward. “The Running Free” is contested often among fans. Some think it’s the beginning of the assault on House Atlantic where others posit that it’s another Crowing focused song with Kilgannon marching (running?) toward his destiny to burn all the worlds. ‘You’re going home, you’re running free’ might refer to seeing this destiny through, and an allusion to death itself. “Mother Superior” is pretty cryptic even by Coheed standards, but it’s thought of as a moment for Kilgannon to gain some much needed faith in what he must do. Maybe he’s visited spiritually or while dreaming by his family, long passed, but returning from beyond to reassure that The Crowing is a fate he can’t shake off, and no amount of apologies will change events already done. Fan favorites “Gravemakers & Gunslingers” and “Justice in Murder” relatively clearly depict the hunting and assassination of Mayo Deftinwolf, and possibly others, by Kilgannon and/or Sizer. Sizer would make more sense and be thematically more satisfying as Deftinwolf murdered his father, Jesse, in Good Apollo, Vol. 1. ‘Justice’ is in the title of the latter track, after all. Regardless, Deftinwolf dies, and our reluctant heroes twisted up in fate use that momentum to fell House Atlantic once and for all in the first song of the suite of this album, “The End Complete”, which was referenced earlier. The suite’s second song, subtitled “Radio Bye Bye”, has two prevailing theories. The first is that it’s a song calling out emergency messages to evacuate everyone not intending to die in a fight to ‘save’ the universe. The second is, after the fall of House Atlantic, Tri-Mage Ryan is nowhere to be found, so messages are broadcasted out on the airwaves to summon him. Some lyrics corroborate both theories (‘we’re calling all cowards now’), and to be fair it’s really anyone’s guess as to what is happening. What is fairly certain is the next song, subtitled “The End Complete”. It’s a suspenseful, cinematic track that details the final fight between Kilgannon and Ryan. They trade vocal barbs as well as physical blows, both men intent on coming out victorious against their nemesis. ‘God, He will not save you’ is likely Kilgannon declaring that God – who he has referred to The Writer as before – won’t save you and write an ending to this fight where you live, or win. Kilgannon comes out on top, as prophesied. So begins the end, but it is not yet complete. “The Road and the Damned” is a goodbye song to everything. Kilgannon says goodbye to his past, to his friends, family, home – everything – knowing that he’s a changed man. He knows his job isn’t done though; not enough worlds have burned yet, which brings us to the final track, “On the Brink”. This track closes out The Amory Wars as we know it (for now). The Crowing watches (or, likely, participates in) the worlds of Heaven’s Fence break apart before his eyes. The Keywork shatters, allowing planets to collide like marbles, bringing about a veritable apocalypse. Much of the lyrics of this song may in fact be the words of The Writer, narrating the end of the story he’s written. The rest of NWFT doesn’t have a clear point where The Writer could interject with his own side of the story, so this may be his one and only appearance during this chapter. Also interestingly, the Coheed motif plays partially in the intro of the song. As stated before, it usually denotes a passage of time, but here it may just be a neat easter egg for the ‘final’ song of the greater story. The primary melody from “The Willing Well IV: The Final Cut” also plays in the outro for the track. One final kick drum and cymbal strike ends the album. Again, this is all theory, collected and discussed from fans all around the internet (though special thanks goes to the r/TheFence community on reddit). These fans, including us, have listened to all of these albums thousands of times between us all, but these are still educated guesses. Claudio Sanchez is notoriously tight-lipped about divulging the stories of much of his work before he himself is able to devote a definitive arc to paper, usually in the form of The Amory Wars comics. Hopefully in the years to come, we can see a visual aide to No World For Tomorrow and have an ending to a wonderfully wild story! A quick sum of events: Claudio Kilgannon and his friends push back against Tri-Mage Ryan and the URA in pursuit of awakening Claudio’s destiny as The Crowing, costing several people their lives including Jesse/Inferno. While all of this is happening, we are introduced to the person writing The Amory Wars story, a man referred to as The Writing Writer, whose delusions greatly influence the story that Kilgannon is part of. In search of ending the story, The Writer directly interferes with it by passing into the universe he created himself, killing Ambellina and setting forth the events of the final chapter. A newly determined (perhaps broken) Kilgannon launches a final assault against Ryan and Deftinwolf, seeing the death of the latter with the help of Jesse’s remaining rebels and IRO-bots, and the former slain by Kilgannon himself before making good on the prophecy of The Crowing of burning Star IV and all other worlds. Heaven’s Fence collapses bringing great destruction. A definitive end to a complex narrative, or so we thought. After years of going back or side stepping, Claudio is bringing a new era to The Amory Wars universe. Today marks the release of a new age of Coheed. You can find our thoughts on the album here, but more importantly, this is the beginning of a new chapter signifying the freedom to explore new characters and build entirely new worlds. We hope you enjoyed our tirade into the part of this prolific prog monolith and enjoy the newly released Vaxis – Act I. Till next time! Next PostInfestus Will Crush Your Bones To Splinters with "Thrypsis"